Bus from KLIA to Alor Setar is one of the important bus services in Kuala Lumpur International Airport because it connects people to go home with direct bus service after overseas trip. Many residents of Alor Setar as well as foreign tourists landing down at KLIA airport, would prefer to take direct bus from KLIA to Alor Setar. By taking direct bus service from KLIA to Alor Setar, passenger can take a short nap in the bus to give them a quick energy boost after a long-haul flight. 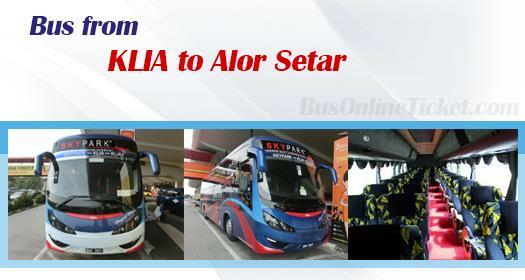 Why Taking Direct Bus from KLIA to Alor Setar? Last time, passengers going to Alor Setar from KLIA airport would have to take KLIA Express or transfer city bus from KLIA to Terminal Bersepadu Selatan (TBS) in Kuala Lumpur, and then transfer bus from TBS to Alor Setar. Now, having direct bus service from KLIA to Alor Setar, passengers save their time, energy, and money from having transit in Kuala Lumpur. Trans MVS Express is the only bus operator serving bus from KLIA to Alor Setar. Trans MVS Express provide only 2 daily departures from KLIA to Alor Setar at 9:00pm and 10:00pm. The duration required for bus from KLIA to Alor Setar takes approximately 7 hours, depending on the traffic and weather conditions. One washroom break will be provided along the journey. The bus fare for this bus service is reasonably charging at RM 70.00. Because of limited departure from KLIA to Alor Setar, we advised you to book your ticket for bus from KLIA to Alor Setar from the most reliable and secured online ticketing portal BusOnlineTicket.com. Booking your bus ticket at BusOnlineTicket.com is not just hassle-free and convenient, but it also helps you to reserve your tickets in advance to secure your favourite seats.